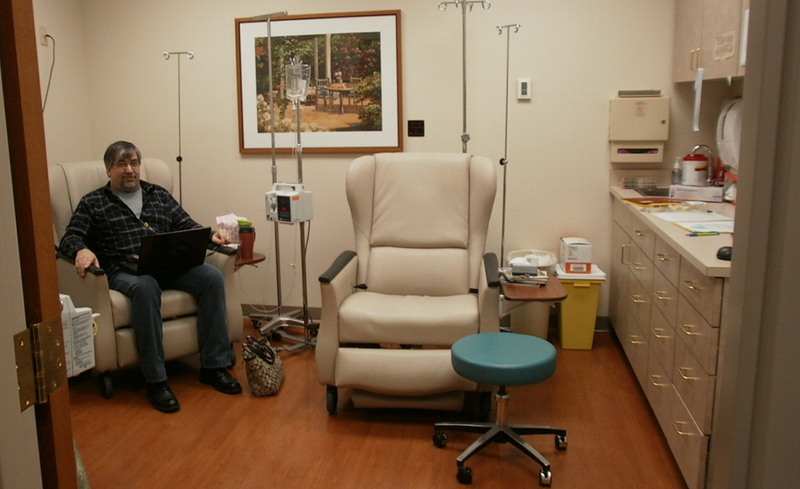 Chemo Session Two – What is CLL ? Heading into my second three-day chemotherapy treatment, I’m feeling better than I have for a very long time. This re-enforces my thoughts that I’ve had this disease lingering inside of me for years now. Besides feeling better, visually I can already see a reduction in the swollen lymph-nodes in my neck. For this, I am thankful, and continue to have a very optimistic outlook going forward. I modified some old tee shirts with a cut-out where the port is located so that the nurses could have easy access to insert the IV tube. They all got a real kick out of the idea. 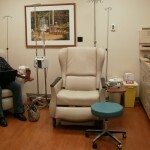 During and after my last chemo treatment, I suffered through a miserable bout of constipation. Taking my doctors advice, the night before my first treatment, I started a regiment of two stool softeners each evening before bed, continuing throughout the rest of the week. This session also marked the first time using my chemo port. In preparation for this, I modified some old tee shirts with a cut-out where the port is located so that the nurses could have easy access to insert the IV tube. They all got a real kick out of the idea. I wear a normal button down shirt, and just undo the top few buttons to expose my port. After IV insertion, I re-button my shirt and all is good. The port really is a much better method for the treatment. It has a more secure connection, and a more direct feed, allowing a better flow rate for the chemo, helping reduce the overall time of treatment. It also gets the tubes off of my arm, allowing me to be able to type normally without interference. Passing time with my laptop in the chemo room. This treatment wasn’t really much different from the first. Day one lasted about 5 1/2 hours, and I felt a bit tired afterwards. Days two and three were similar to the first time, lasting about 2 hours each. I did have some indigestion on the second day, which was easily remedied with some medication similar to Prilosec. I still haven’t had to deal with any nausea with either treatment, but I haven’t quite solved the constipation problem. Although not as bad as the first time, I still suffered through a few days of small movements and a very uncomfortable bloated feeling. I went back to work on Friday, and felt good all day. Over the weekend, the fatigue set in, and I spent most of the time relaxing and napping. By Monday, I felt fine, and went back to life as usual. Please feel free to comment here, or send me an e-mail if you have any questions or want to share your story. I’d like to invite you to continue to follow along as I document the details of my journey. Thanks for visiting, and be sure to share this with someone who may benefit from it. Hello Nick, thank you for your blog. this was very helpful in what to expect later this year when I may start my FRC treatment. I like your last note that you went back to life as usual. I find it is best to participate in life more than to focus on the leukemia. The tee shirt hole is a great idea. I’ll keep it in mind when/if I get to the chemo stage. (I have type CLL leukemia.) Take care. Hi Nick – I’m just starting my journey. Tomorrow the port is installed. I will have radiation five days a week for 4-6 weeks and chemo one day a week for 4-5 weeks.. The unknown is terrifying but your journey was helpful. Diagnosed 4 yrs at end stage . 3 rounds of chemo it’s back and am doing watch and wait .. I am 46 now and find it seems to attack those 60 + more than my age ? Confused about will I get chemo again ? Will I be offered bone marrow transplant ? Or what other options do I have ? Help !!!!?? ?